(February 6, 2013) River Rock Properties has submitted a rezoning petition for a 2.63 acre parcel located on the south side of York Road between Grand Palisades Parkway and Langston Drive. (See Rezoning Petition 2013-004.) The purpose of the rezoning is to consolidate two parcels under one conditional zoning district to accommodate up to 25,000 square feet of office uses permitted in the O-1 district. Walter Fields, consultant representing River Rock Properties, has scheduled a community meeting for Wednesday, February 13 at 5:30 PM in the Community Room of the Steele Creek Library at 13620 Steele Creek Rd. The meeting will be held on Wednesday, February 13th at 5:30 PM in the Community Room of the Steele Creek Library at 13620 Steele Creek Rd. The meeting time is based on the library hours and will be concluded by 6:45. 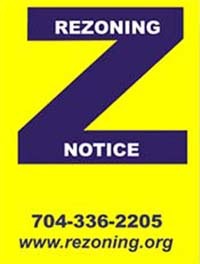 The Charlotte City Council is scheduled to hold a public hearing on this petition at its rezoning meeting on March 18. The City Council likely will vote on this petition at its April rezoning meeting.